It had been over two years since I attended the grand opening event of the Kingsway location of the Captain’s Boil. I had received a lunch voucher valued at $20 from attending the event and finally decided to use it last week when I was in the area. Here’s a look at my lunch experience. If you’re not familiar with the Captain’s Boil, it’s a restaurant chain which specializes in boiled Cajun and Asian-inspired seafood feasts. The recipes were inspired by Asian Fishermen who immigrated to the US Gulf Coast during the 70s and gave traditional Louisiana Creole-inspired crawfish boil a twist by adding Asian spices and aromatics. At the Captain’s Boil, it’s about getting up close and personal with the seafood. Forget about the cutlery and chopsticks. Instead, you’ll be wearing plastic gloves, donning a fashionable nautical-inspired bib and eating with your hands. The protective gear will help but you’ll likely be taking the experience home….with the residual smell. Tip for the ladies, don’t forget your hair ties. How it works is you first choose the seafood “catch” (like King crab legs, shrimp, Louisiana crawfish, lobster, clams, mussels and more). Then, you choose your spice level (Non-Spicy, Mild, Medium, Fire) and your spice flavour (Cajun, Lemon Pepper, Garlic Sauce or the Captain’s Boil – the tri-mix). The seafood is either market price or by pound. Side options include fries, corn, chicken tenders, fish & chips and more. Also available are sizzling plate combos like fish or chicken teriyaki. 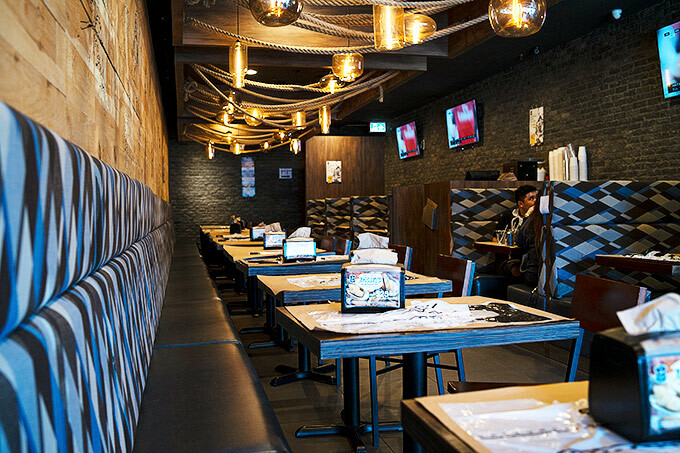 For drinks, The Captain’s boil offers beer, soju, sake, pop, iced tea and so forth. If you want to check out the prices ahead of time, visitwww.thecaptainsboil.com and select Order Online and the location that you want to visit. The Captain’s Boil is currently running a promotion of All You Can Eat Mussels and Bottomless Fries with the purchase of a drink for $25.99 per person. I honestly cannot imagine doing AYCE mussels due to the amount of cholesterol you could be potentially be intaking…but to each their own. Well, what does $20 get you at The Captain’s Boil? I went with my favourite items at The Captain’s Boil: shrimp and corn in Captain’s Boil sauce with mild spiciness. 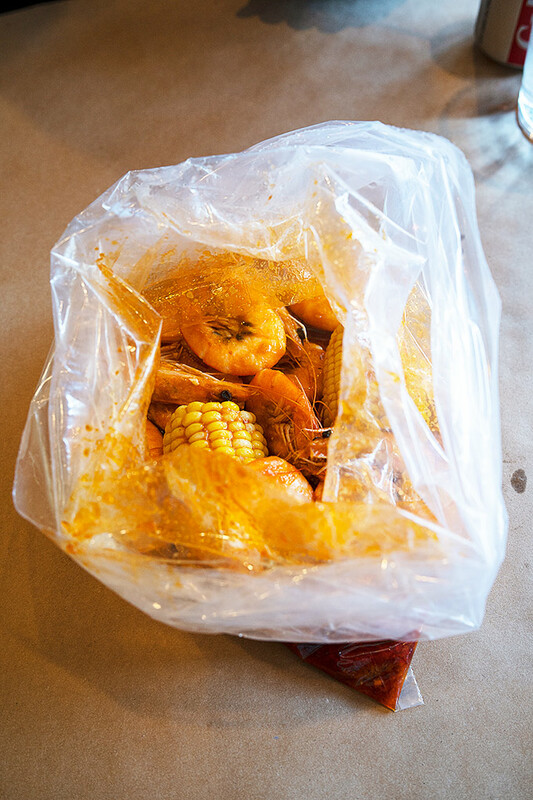 That’s one pound of shrimp ($15), 2 pieces of corn (2 x $1.50) and a Diet Coke ($2.50). That came out to be $20.50 plus tax and tip. 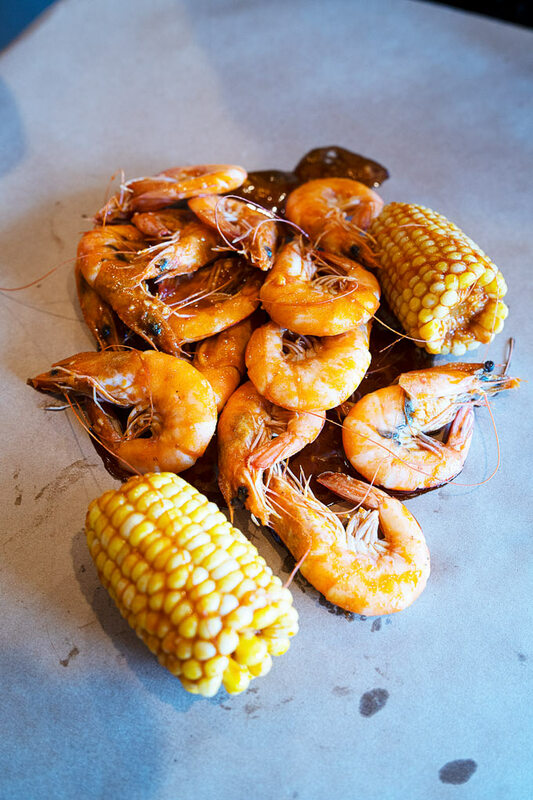 The shrimp and corn were pre-cooked in the kitchen in Captain’s Boil sauce. They were delivered and dumped onto my table in plastic, foodsafe bags. The flavour and quality of my food were consistent with what I have had at the Captain’s Boil in the past. The shrimp sizes were reasonable and the corn was nicely juicy and sweet considering the time of year. Our server (who might have been the manager) was not as attentive as I would like. She took the order in a timely manner, delivered the food but I didn’t really interact with her after that. I had to pay at the front because she stayed there mostly.